In the wee hours of a recent night the greater part of a Challah loaf went missing. I might have suspected Santa or his hungry elves if it weren’t for the trail of crumbs that led to a few bites of sandwich left scattered in the kitchen sink. Turkey and swiss: sure signs that my son the meatatarian had been snacking. His midnight raid got me thinking. If Challah is so tasty (which it is) and makes such a good sandwich (which it does), then why not have it more often – say, in sandwich roll form? So I made these rolls a few days ago and, with visions of savory sandwiches dancing in my head, I retired for the night. One roll, nibbled around the edges, was all that remained in the bag the next morning. In his bed, my son slept on in angelic innocence. I closed his door quietly, reflecting on the difficulty of being 14 again: in one fell swoop I’d crashed the gates of that awkward age. Here was a father’s love, wrapped up in a package that for once was not rejected. Was I angry? Heck no! I rolled up my sleeves, took down some flour and, whistling, got back to work. Make the sponge: In a large bread bowl, mix ½ cup warm water with 2 teaspoons of dry yeast. In a small bowl or measuring cup, crumble a pinch of saffron into ½ cup of boiling water. After 15 minutes, put 1 cup of bread flour into the yeast mixture and pour the cooled saffron tea on as well, keeping back the strands of saffron. Mix well with the handle of a wooden spoon until there are no lumps of flour. Cover and let sit in a warm place (80°- see note below) for 1½ hours until frothy. Make the dough: Add one egg, 1 Tablespoon of sugar, 1 teaspoon of salt and 3 Tablespoons of softened butter to the frothy sponge. Now add 1½ cups of bread flour and mix until you have a soft dough. Scrape down the sides of the bowl as necessary. Sprinkle the remaining ½ cup of flour onto a counter, scrape the dough out of the bowl onto it, and knead the dough for 5 minutes until most of the flour is incorporated. 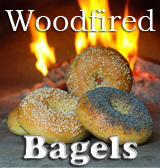 Clean out the bowl, put the dough back into it and let rise, covered in a warm place for 1½ hours, until doubled in bulk. 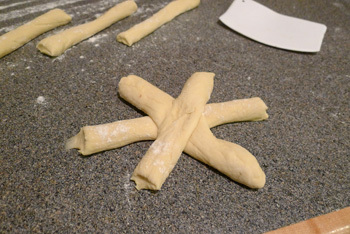 Make the rolls: Put the dough back on the counter, press most of the air out of it and cut it into 6 pieces. Roll each piece into a rope about 15” long. Cut each rope into 3 pieces and use these pieces to make a star. Flatten the center of the star with your thumb and then bring the 6 ends into the middle as shown. Push the center down with your thumb to make these ends stick. Put the rolls 2 inches apart on a cookie sheet lined with parchment (best) or coated lightly with butter. Brush each roll 2 or three times with an egg yolk well mixed with a little water. Sprinkle generously with poppy seeds. Bake the rolls: Preheat your oven to 400° for 20 minutes. If you have a pizza stone (or quarry tiles), set it on the middle rack. Lower the temperature to 375° and bake the rolls for 22 to 25 minutes, until nicely browned on top. Remove to a rack to cool before digging in. Enjoy! Note: To create an 80° environment, turn on your oven for 2 minutes and then, once it’s mildly warm, turn it off again. Now put a pan of boiling water on a low shelf in the oven and turn on the oven light. Put the dough on a higher rack. Or, you can put a 100 watt light into a cupboard along with a thermometer. With some finagling, you can achieve excellent results. Now, if you happen to have teenagers in the house and you want some rolls for yourself, I’d recommend you either make an extra batch… or hide a few, which is what I ended up doing! These look just beautiful, and I am certain that they are delicious. Thank you for the detailed instructions…I could never figure out how to get that lovely shape, lol! What a wonderful post! Wishing your fortunate family a wonderful New Year! Beautiful rolls! 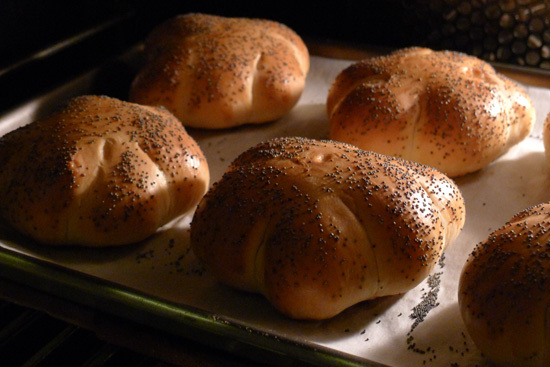 You are a bread-making genius to put challah into roll form. And that sandwich looks perfect. I like how generous you are with the avocado. I hope your son knows how blessed he is to have such amazing parents. These buns look wonderful and are a sure try. Much more wonderful is the way your love shines through for your son and the rest of your family. How blessed they are to have you to love them. Praying you have a New Year filled with blessings! I made some Challah rolls recently but they were not this pretty. I love your folding technique. I have been cooking for a very long time but am new to yeast baking and am having a great time learning. I would have never guessed that is how you make the design in the rolls. Beautiful! 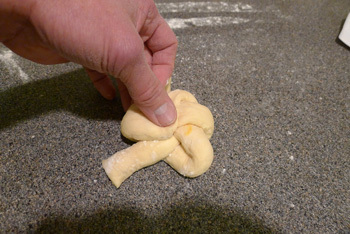 This is one of my goals for 2012…conquering the Challah bread. 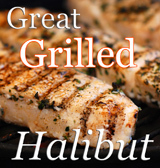 It is easy to see why these would not last long around the Sortachef kitchen. I hope you all have a fulfilling new year and that all of your dreams come true. Beautiful! All you’re missing is the Bubbe…. These rolls are so pretty! 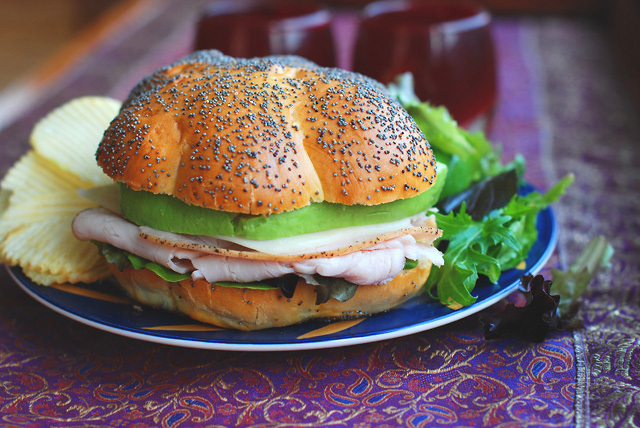 I can’t wait to try making these…that sandwich is just calling my name! Happy new year! I use an excellent bread machine recipe to make dough for Challah bread, but I’ve seen this sponge method before and always wondered how that changes the bread consistency?